Championship Brighton have completed deals for four players. The Seagulls have paid undisclosed fees for Swansea duo Andrea Orlandi, 28, and Stephen Dobbie, 29, who have signed two and three-year deals respectively. Athletic Bilbao's David Lopez, 29, arrives on a free transfer on a one-year deal, while fellow midfielder Dean Hammond has signed from Southampton. Hammond, 29, was in talks with Charlton but has opted to return to his hometown club on a season-long loan. Meanwhile, Brighton striker Roland Bergkamp has joined Dutch side VVV-Venlo on a season-long loan deal. The 21-year-old, the nephew of former Arsenal and Netherlands legend Dennis Bergkamp, joined the Seagulls last summer but has not made a senior appearance. He played three games during a loan spell at Rochdale last season. Striker Dobbie was a target for Blackpool over the summer, after he enjoyed two loan spells at Bloomfield Road. 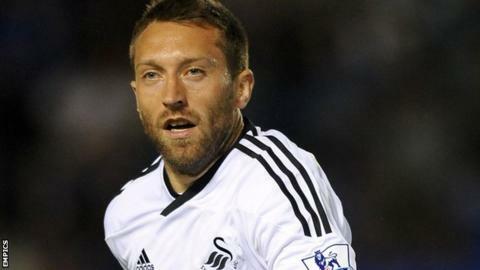 He spent three seasons with Swansea but started only two games last term. Spanish winger Orlandi made 90 appearances for the Welsh club, scoring three goals, after joining from Deportivo Alaves in 2007. However, he was restricted to just five games in all competitions for the Premier League outfit last season. Lopez has played more than 150 games in the Spanish Primera Liga for Bilbao and Osasuna. Hammond came through Brighton's academy and made his senior debut in 2000. He went on to join Colchester then Southampton in 2009, and captained the Saints to back-to-back promotions.